Stevia Side Effects : is Stevia harmful? Stevia is generally considered safe by the FDA to be used as a sweetener in beverages and foods. Stevioside in the whole leaves has some great health benefits, but processed stevia products which contain only rebaudioside are not a good option. Stevia side effects on stomach, brain, blood pressure, reproductive system, etc. are considered. 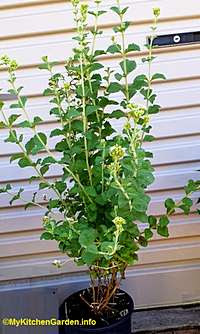 You can grow stevia (how to grow stevia) at home and use its leaves for sweetness. Altered Stevia and Truvia are not good for health (health benefits of stevia) because of their processing technique and added ingredients. Although Stevia is often used to treat heartburn, diabetes, high blood pressure, preventing pregnancy, lowering uric acid levels, there may be some rare side effects. Stevia side effects on stomach, brain, blood pressure, reproductive system, etc. are considered. Stevia has not been approved by FDA for its use as a food additive because stevioside in stevia may have side effects on the kidneys, heart, blood sugar and reproductive system. The side effects may be due to large doses of stevia (stevioside). There is no scientific study to determine the safe doses for stevia. Stevia can cause allergic reactions in those who already have an allergy to daisies, marigolds, chrysanthemums or ragweed. In such cases the reaction may cause difficulty in swallowing, shortness of breath, dizziness, pale skin or weakness. If you are allergic to these plants, you should avoid using products with Stevia sweeteners. There may be mild symptoms of decreased appetite, upset stomach, nausea or bloating. People with diabetes should carefully monitor their blood sugar while using Stevia products and diabetes medications. Lower Blood Pressure: Stevia may lower your blood pressure, so you should consult your Doctor before using Stevia as an artificial stweetner regularly, if you have low blood pressure. If you are on medication to treat high blood pressure, you should not use Stevia. However, further research is need. Other side effects of stevia include numbness, dizziness and body aches. Pregnant or breastfeeding women should avoid using stevia products. The Effect of Stevia Rebaudiana on Serum Omentin and Visfatin Level in STZ-Induced Diabetic Rats. J Diet Suppl 2014. Melis MS, Effects of chronic administration of Stevia rebaudiana on fertility in rats Journal of Ethnopharmacology 1999 Nov 67(2): 157-161.